Previously unpublished letters from the private correspondence of the Roxton family, spanning 1743–1777, with extracts from the diaries of Antonia, 5th Duchess of Roxton and 7th Duchess of Kinross. Includes Roxton’s last letter to Antonia. Volume One complements the early chronology of the award-winning Roxton Family Saga: Noble Satyr, Midnight Marriage, and Autumn Duchess. With a foreword by a late-Victorian descendant, Alice-Victoria, 10th Duchess of Roxton. Reading these letters conjures up treasured images of the books featuring the letter writers. 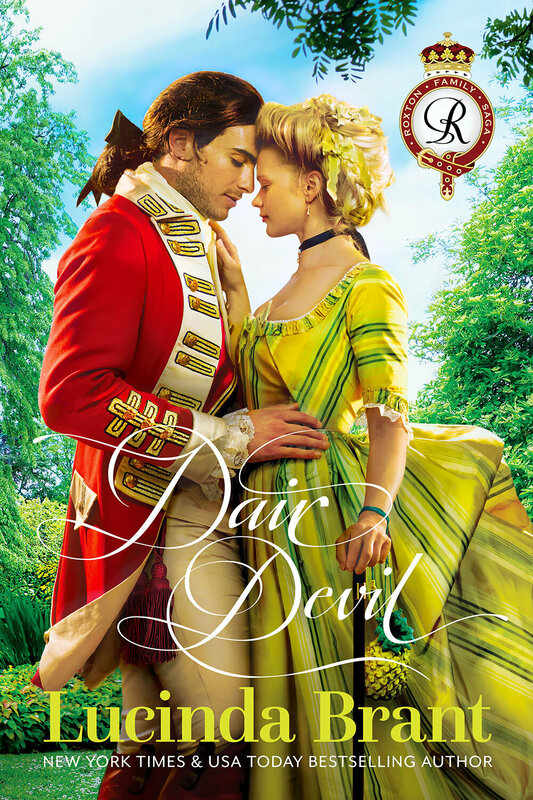 Brant captures the imagination and makes you privy to very private moments of some of the best characters ever developed by a historical romance author. Engaging as any Brant book, these letters set the stage for all the stories—kind of a behind-the-scenes narrative. Each and every one of the books in this series earned a five star rating. Eternally Yours reminds me why, and candidly inspires me to revisit these amazing books that gloriously magnify the joy of the genre. Mlle Moran, Hanover Square, Westminster, England, to M’sieur le Duc d’Roxton, Hotel Roxton, Rue St. Honoré, Paris, France. Joyeux Noël et bonne année, Monseigneur! The Twelfth Night celebrations they have just ended, but I could not sleep, so decided to write and tell you all about them. You, I am very sure, know all about the silliness of this season in England, though I am certain you did not partake of it, but sat back and observed it all through your glass with that look, half-incredulous half-disdainful, which annoys others no end, but which makes me giggle! For I know inside you are shaking with laughter to see what people they will lend themselves to with the excuse that everyone they are silly upon such occasions, and never more so than on Twelfth Night! I am determined one day Vallentine he will play at Bullet Pudding with me. Do you know this particular Yuletide game? Perhaps you played it as a boy? No! Even then I think you would have abstained but enjoyed watching others make fools of themselves. I do not doubt that Vallentine he was one of your hapless victims. But I know there is no malice in you, and that Vallentine he would have enjoyed the game for its own sake. Let me tell you all about it. You will enjoy hearing how silly it is, particularly when I tell you who participated at the Twelfth Night revelries at Grandmama’s house. Yes indeed, we played these games in her drawing room. I insisted, for how else can I become a proper Englishwoman if I do not know all the English traditions? And so I argued this to Theo, who argued with Grandmamma, and was supported in his arguments by Lady Paget, Miss Harcourt and her brother Percy. Finally, Grandmamma threw up her hands in capitulation, saying we could do what we liked. I see your smile at this great manipulation of mine. But it was for the greater good, I assure you. For why should we all not join in the revelries of such an occasion? While you would not join in, you would never stop another from such enjoyment. So this game of Bullet Pudding. Let me tell you about it. Firstly, what is needed for the game itself is—A quantity of baking flour, a large silver platter, and a bullet. Such strange things to bring together. Incroyable, no? The platter it is put in the middle of the table, and the quantity of flour is piled high into the shape of a steep mountain on all sides, a volcano of sorts. There is skill involved in making the shape, and the flour is tightly compacted so it neither slides down nor collapses in on itself, but remains in this volcano shape. Atop this flour volcano is carefully placed the bullet, and in such a way that it does not sink immediately. This perfect little round ball of lead must remain at the apex until the game, it begins. The placing of this bullet requires a steady hand so that it does not immediately fall through the flour to the platter and is lost. Which means the game it is over before it begins! Theo has the steadiest hand, so it was left to him to place the bullet without disturbing the pyramid of flour. He took his time and was very careful and slow. But he was too slow for Grandmamma, who would not stop complaining that he was taking too much time, and that perhaps one of the servants would be better at placing the bullet. I do not know how Theo he kept his temper, but he did. I suppose there were a great many people standing around the table eagerly waiting to play this game. So the bullet it was put in place, and then the fun it truly began. Everyone who is playing the game is given a butter knife. Each person then takes a turn to carefully insert their knife into the mountain of flour, and then withdraw the knife just as carefully so as not to disturb the flour and thus disturb the bullet from the apex. Once everyone has had their turn, it all begins again. Of course we all became impatient and this makes us falter. Most of us are laughing at the others as the flour it begins to subside and the bullet it begins to sink! And what do you think happens when the bullet it disappears into the flour? We abandon our knives and take it in turns to poke our noses and chin into the flour to find the bullet. Using our hands is forbidden. The only legitimate way permitted to extract the bullet is using our mouths. Of course by this stage, there are fewer of us playing at Bullet Pudding. Charlotte for one would not dip her face into the flour, neither would Lady Paget. Theo, he too was not eager to do so, but I said I would be more than a little upset with him if he did not join in the game. After all, if M’sieur Harcourt was brave enough to stick his face in the flour to find the bullet, as was I, why not Theo? So that just left the three of us with the others withdrawing and watching on in astonishment, because, Monseigneur, I was as determined as anyone to find that bullet, regardless of the flour to my face or gown! But let me tell you that laughing and flour do not mix! I was having such an enjoyable time that I could not stop giggling to see M’sieur Harcourt and Theo, their faces covered in flour with only their eyes blinking out at me! I realize I too must have presented the same ridiculous sight to them, for we were laughing so hard, that we were blowing the flour all over the table! And poor M’sieur Harcourt, he ended up having a coughing and sneezing fit because he breathed in some of the flour, and it went straight up his nose, and his eyes they would not stop watering. Soon his face it was covered not in flour but a strange dough as his tears mixed with the flour, causing it to clump. The sight was most hideous, and because it was hideous we Theo and I laughed even harder. And so the cycle of silliness it could not be broken! Naturally, Grandmamma she was not pleased to see the game turn to the ridiculous, and tried to call a halt to it, when at that moment, Theo lifted his head up out of the flour with an almighty dramatic whoosh, and there, clamped between his grinning teeth, was the bullet! Everyone applauded wildly, I suspect with relief, but most of the laughter was directed at Grandmamma, because when she stepped over to put a stop to our silliness it was at the same time as Theo he lifted his head, and the flour on his face shot out like a great white cloud when he breathed out, and covered Grandmamma from head to foot in flour! So you see why I think Vallentine he must play at Bullet Pudding with me. I will tell you about one other game before I conclude this letter and try and sleep, because it is now very late and my candle will soon gutter. I could light another but Grandmamma she now has the maids counting my candles and reporting back to her, so that she can determine for how many hours I remain awake at night when I should be sleeping. I would like to think she is doing such a thing because she is worried after my welfare, but I am not so naïve. She worries, that is true, but worries that I am still awake late at night when she is entertaining one of her lovers, and that I might hear the comings and goings from her room. These lovers, they do not stay the night, and so the footmen they must wait up to show these footlickers (not a nice word I heard Theo use for these men who visit his mother) the door when it is time for them to leave. One night there was a very loud noise on the stair outside my room, and I am sure it was one of these men tripping, possibly over their own feet, as he scurried off into the night. But I will not write any more details of that, because I think I have already mentioned these nocturnal comings and goings in a previous letter, and to repeat it will bore you. But what I will repeat about these carnal encounters is that while my grandmamma and her lovers gain a temporary satisfaction for the body, her heart, I am very sure, remains dissatisfied, and her mind empty. I do not see the point in satisfying oneself physically without engaging the heart and the mind in such pleasurable activity. Only then can one truly be satisfied. These men are young enough to be her sons, and I am very sure they are not thinking with their brain at all, and certainly their hearts are left outside the door. But I cannot deny that these nocturnal trysts do make me miss you all the more, because I miss making love with you very much. But this feeling is all the more empty because my mind and my heart are even more bereft without you. I miss most lying wrapped in your arms in your big bed, half asleep and yet half awake, with all the covers and pillows around us and we two snuggled in, away from the world, away from everyone and everything. Just the two of us. See, I have wet the ink with a tear, and you will think me a great baby for my sentimentality, but I cannot help it. It is the way I am and the way I feel. I have dried my eyes now, and will continue for a little bit and then will sleep. Perhaps tomorrow I will wake and find that there is a letter from you waiting. So this other game we played tonight, after we had cleaned ourselves of the flour—though not very successfully because Theo and I were still finding amusement in our appearances an hour later. We must have been grinning at each other, because Grandmamma she wanted to know what the private joke was, and it did not matter that we told her there was none. She thought we were keeping something from her! This other Yuletide game requires a bowl of brandy, some raisins and almonds, and flame to set the spirit on fire. The raisins and almonds are put into the bowl and then brandy poured in, just enough to cover them. The brandy is then set alight! Yes! So that there is a blue flame and the bowl glows! What stops the breath and heart is that the players are then required to dip their fingers through this flame to pick up as many of the fruit and nuts as they can before their flesh it burns. Each player takes a turn, and depending on how many almonds and raisins are scooped up at each turn, more are added, and so is brandy, and relit! I assure you none of us had our fingers burned. And the gentlemen with lace at their wrists removed it or tucked it up so it would not catch on fire, as apparently this happened to a guest at another party, who caught his lace on fire and then ran around the room screaming. Theo says he was not even badly burned, but it was the shock of the thing. I managed to scoop up five almonds and two raisins for my efforts. But I was giggling, which did not help. The greatest part of this game is watching the faces of the others as they dip their fingers through the flame, at first horrified and transfixed, then when they are not instantly burned they relax a little, which is the wrong thing to do because they become complacent, and that’s when the flame it will burn, if you linger. I miss your company so very much, and more so, if that is possible, at this time of year with all the family gathered enjoying themselves hugely. It does not seem right to do so without you here with us.